As we have pointed out before, 360° Breathing is critical to teach all of your clients for optimal “Core Canister” function. However, teaching 360° Breathing to your clients and having them actually execute it properly are two different animals. There may be several reasons for clients’ sub-optimal breathing patterns (which are beyond the scope of this article), but the one we will discuss today pertains to restrictions in the soft tissues connecting to the ribs, preventing their full expansion. Like all movements the body makes, breathing requires good mobility of the soft and skeletal structures to perform it most effectively. Without full range of motion of the ribs (to which the diaphragm attaches), the diaphragm cannot descend properly to allow for full inhalation. This is especially true in the lateral and posterior directions. See this 3D view of the diaphragm in action to help illustrate. To use a squat analogy, think about how squat depth can be limited due to tight hip flexors. You may try to stretch the hip flexors, and do some foam rolling or other mobilization strategy in order to free the restriction. Assuming you were successful, the squat should get deeper after revisiting it. This same concept can be applied to the tissues in between, and attaching to, the ribs. If those tissues are restricted, doing some mobilization work can help to free tension that is restricting adequate rib movement for optimal 360° expansion during the inhale and release on the exhale. The good news is that the answer to better breathing is, well, breathing. But, specifically, breathing in different positions in order to increase suppleness and elasticity of the tissues connecting to the ribs. This is called positional breathing. To paraphrase Gray Cook, in order to own a position, you must be able to breathe there. If you notice that your client has trouble expanding her ribs laterally after trying many different cues (i.e. 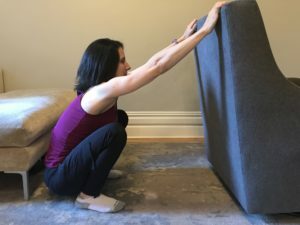 verbal, tactical, visual demonstration), try putting her in a position to work on mobilizing the tissues that will enable maximal expansion. First step is to assess her 360° breath and determine the main area(s) of restriction on the inhale. Most clients will either have trouble expanding laterally or posteriorally. If a client has trouble with lateral expansion, have her lie on her left side with a foam roller (or pillow) underneath her left ribs, essentially having her right ribs fan open like an accordion. Place your hand on the lower right ribs. First have her exhale all of the air out of her lungs and then cue her to focus on inhaling/expanding into her right ribs. Once at full expansion, have her hold the air in place for a few seconds before slowly exhaling, at which point you gently guide the ribs down and in. Repeat 5-8 times. Perform the same procedure on the other side before reassessing in seated. You should see an improvement in lateral rib expansion. Watch this Positional Breathing Video for a demonstration. For a client having trouble with posterior expansion: have her perform a deep squat while reaching forward to a pole, TRX, or other stable object at or above shoulder height, like in the image below. To goal is to position her so that her shoulder blades remain protracted and her pelvis is in a posterior pelvis tilt. From this position, ask her to first exhale all of the air in her lungs and then focus the inhale on filling the space in between her shoulder blades and down to her lower back. Hold the air in place for a few seconds before exhaling completely. Repeat 5-8 times. 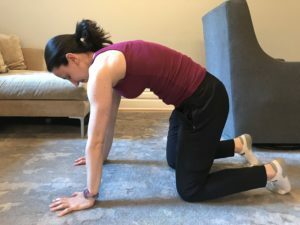 Alternatively, if your client cannot deep squat, then she can perform the breath work in quadruped, ensuring that she stays in a protracted position with a posterior pelvic tilt, as shown below. Again, always re-assess and see if these mobilization strategies assist in helping your client achieve a more optimal 360° expansion.